FRISCO, Texas -- Carson Wentz had big shoes to fill. North Dakota State has become one of those programs that reloads on the fly, but with the way 2014 started for the Bison, it seemed like a bit more rebuilding than usual was necessary. Brock Jensen, a four-year starter at quarterback in Fargo, was out the door after three consecutive championships. So was head coach Craig Bohl, who took a job at Wyoming. In spite of that, as well as the loss of 23 other seniors, the Bison machine rolled along to a fourth Football Championship Subdivision title in four years, defeating Illinois State, the team it shared the Missouri Valley Football Conference title with, 29-27 on Saturday afternoon. Illinois State came just short of beating four time consecutive champs North Dakota State in the FCS championship game. ISU's Tre Roberson was 11-of-23 for 157 yards and one touchdown but threw a pivotal interception in the final seconds of the game. And it was Wentz, a junior and in his first season of seeing meaningful time on the field, who orchestrated a six-play, 78-yard drive in the final minutes to secure the win for the Bison. His counterpart, Illinois State quarterback Tre Roberson, ran 58 yards into the end zone at the 1:38 mark, giving the Redbirds the lead and severely threatening the Bison’s reign atop FCS. Wentz responded by completing passes of 32, 13 and 33 yards, all to freshman receiver RJ Urzendowski, before punching it in himself on the ground from five yards out to give back North Dakota State the lead it held for most of the game. On the ensuing Illinois State drive, Esley Thorton sealed the game with an interception, sparking the large contingent of Bison fans among the 20,918 at Toyota Stadium into a familiar-feeling celebration. 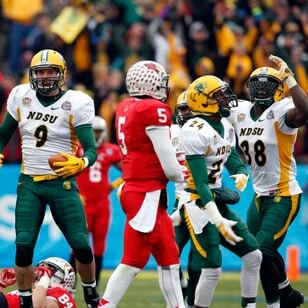 North Dakota State becomes the first FCS team to win four consecutive titles. Eastern Kentucky (1979-82) and Youngstown State (’91-94) each made four in a row, but neither won all four. The only other college football team to make such a run is Augustana (Ill.), which won every Division III title from1983-86. It is the second time an NDSU team has won four in a row, with the other being the women’s basketball team from 1993-96. “With our guys, you never saw any doubt in their mind,” Bison first-year head coach Chris Klieman said. “You never saw panic in their eyes. We've obviously been in this situation before, even in the playoffs, and our guys just know that, hey, it's our time. The Bison had taken a timeout before the game-winning touchdown, and Wentz said that they set up two plays out of the timeout. The first one was designed for him. The second turned out to be unnecessary. The difference with this championship from the previous three is that it came with different faces at the two biggest leadership positions on the team. It caused doubt at the beginning of the season -- at least from outside the program. Wentz, from Bismarck, North Dakota, has been around for all three previous championships. He was redshirted for the 2011 title run, his first season in Fargo. Then he sat behind Jensen, who became a Bison legend, for the next two seasons. North Dakota State’s blowouts allowed Wentz to see some time on the field -- he completed 34 of 46 attempts in 19 appearances -- but Saturday was the first time he threw a pass in Frisco. While the result is the same, the way Wentz got there was a bit different from the way Jensen did. Opposing defenses are have been on their heels all season dealing with Wentz’ ground game in addition to his passing game, and his season total of 642 yards on the ground is the best for the Bison since 1996. Wentz showed off his fleet feet and running ability early and often throughout Saturday’s game. It got off to a bit of a rocky start as he went for a long gain after a scramble on the first drive, his third rush of the drive, only to fumble and turn the ball over. At 6-foot-5, 222 pounds, Wentz is not afraid of taking a hit as he fights for extra yards. Despite the early fumble, he continued to go on the run and pound away for those yards, as well as use his maneuverability to escape several sacks. In the second quarter, a play seemed dead in the water, but Wentz rolled out away from incoming Redbird defenders and found a wide-open Zach Vraa for a 42-yard gain. That play led to the score that put the Bison ahead 10-7. Wentz finished the game 15-of-22 passing through the air for 237 yards and a score, and led the team in rushing with 87 yards on 16 attempts, including a team-long 35-yard scamper. So the North Dakota State system passed its big test. The people who led (and won) before left, and new ones stepped into their place without skipping a beat. Now, a senior class that has gone 58-3 in four years departs, but if this year is indication, there isn’t any reason for Bison fans to worry about that.